The little bundle of supplies needed to make this brag book have been sitting in my “current projects” bag for about a month now. While planning my posts leading up to Mother’s Day this one caught my attention. Most of you know I am a mom, a dog mom, to a sweet little boy. As many of my friends have had children and I have not, I have come to somewhat view Mother’s Day as a day of honoring the female caregivers in our families. Therefore; if you are a dog mom like me or a mom to a hairless breed you can make this brag book for yourself or for someone who has been a mother in your life. Before beginning this project you may want to consider a few things. Most importantly, who is the recipient of this book? Let’s say you are making this for your mom. You may choose memorabilia from your own childhood like some nostalgic piece visible in one of the pictures you select for the book. Tiny belts, choker necklaces, shoelaces, ribbons and hair bows will all work in place of a collar. 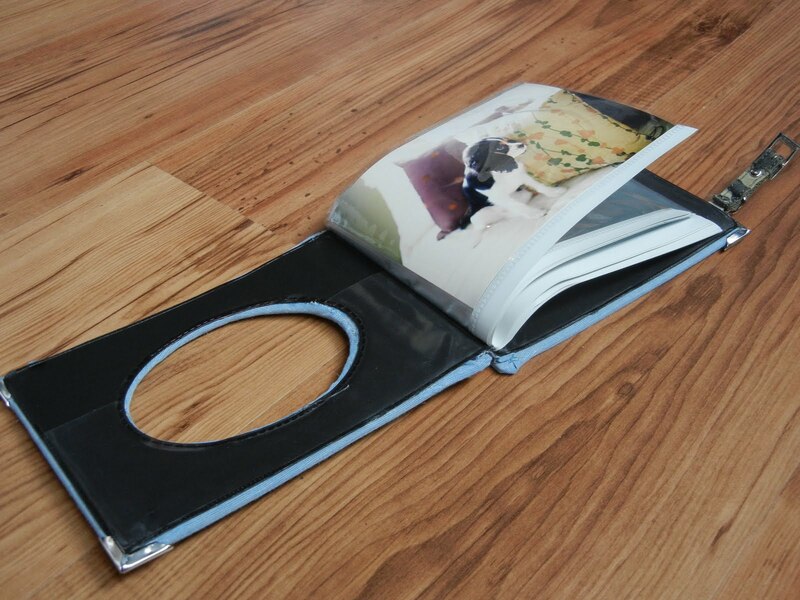 Just look through the pictures you want to place in the book to start your mind rolling with ideas. You may also consider using an old shirt for the fabric cover. T-shirt fabric will work well. Puppy collar, Children’s shoelaces, fabric headband, etc. First check to make sure your 5”x7” cardboard pieces will cover the plastic flip book. I believe this is the standard size. If this is not the size you have you will need to make adjustments as you go. Choose a fabric that is not thick or bulky. You will want it to have some give or stretch, too. 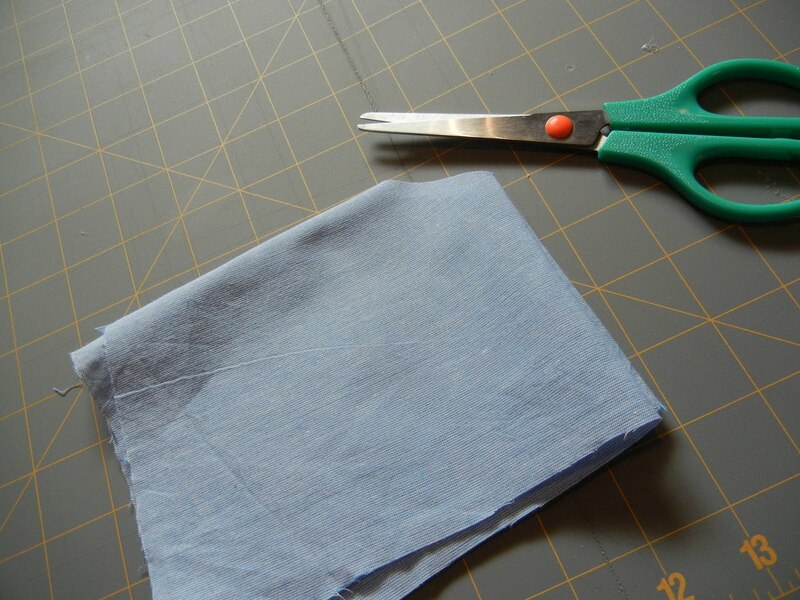 Cut your fabric rectangles to the sizes specified above. Trace just inside the oval of the plastic flip book on to your cardboard and cut with your exacto knife. 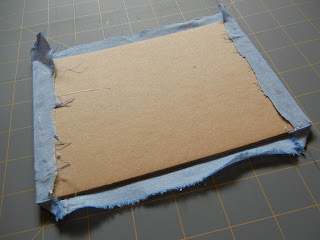 Starting with the back cardboard or solid piece lay a strip of hot glue on parallel sides, stretch the fabric (medium size piece) tight folding the edges into the glue. Now you want to miter the corners for a clean finish. 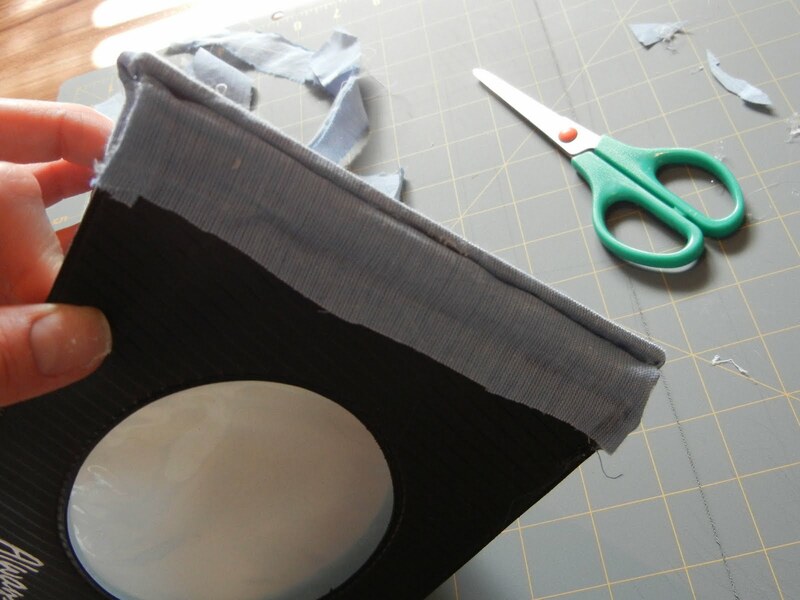 Place a small drop of glue inside the top corner of your folded fabric. 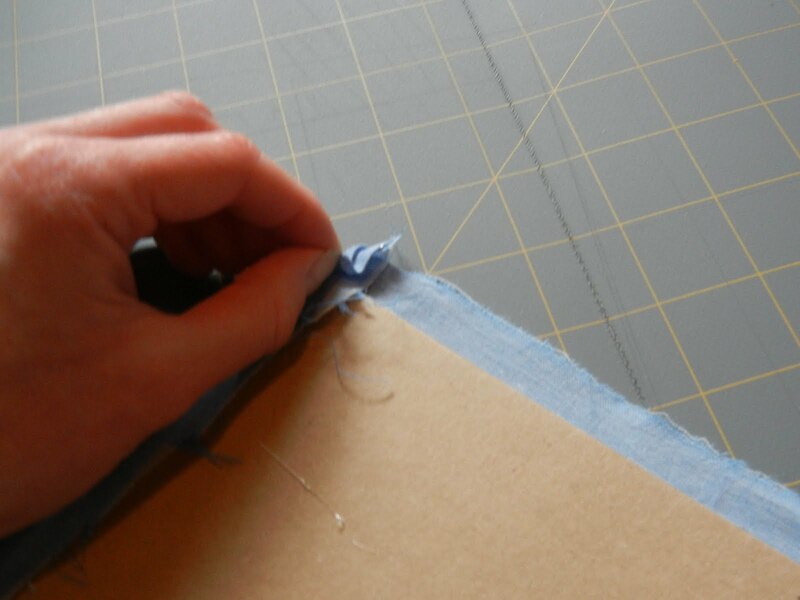 Pinch the outside edge and fold in (on top of itself) making a triangle. Then lay another strip of glue along the edge of the cardboard on the unfinished sides and glue them down. Now that the back piece is finished we need to cut the hole in the center of the front (larger) piece of fabric. Fold length wise then width wise making a square and cut the folded corner. 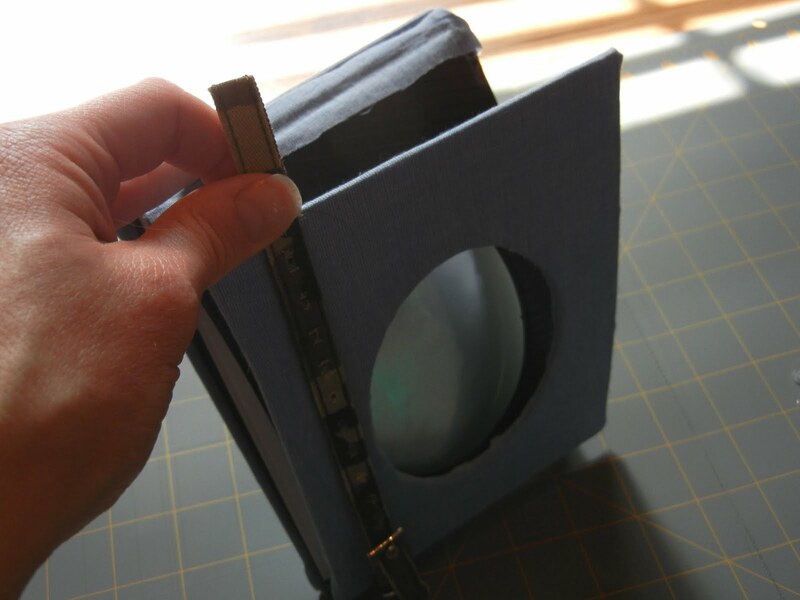 Unfold the fabric and place it beneath the front cardboard piece. 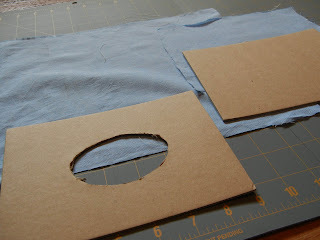 You should see a diamond shape cut into your fabric through the center oval. 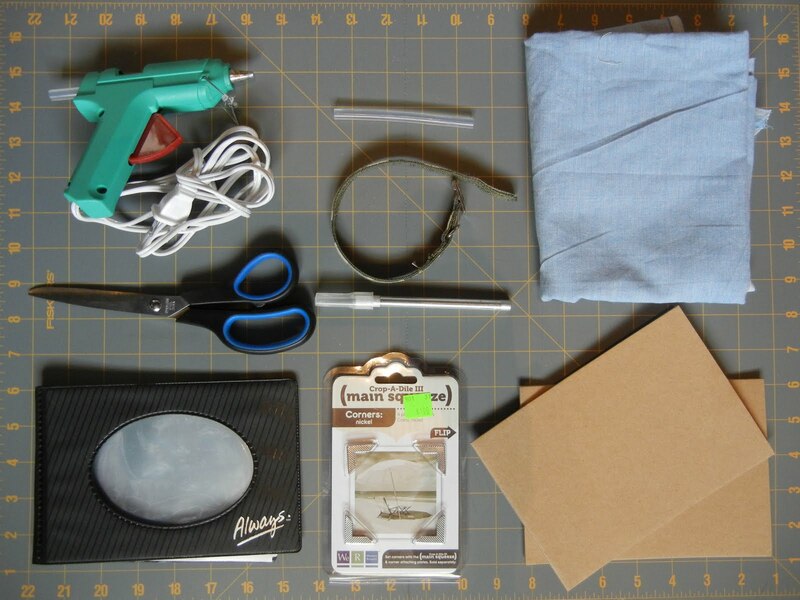 You will want to clean up the diamond to an oval shape about ½” in from your cardboard oval. Glue and miter the outside edges as you did on the back cardboard piece. To finish the front you will want to stretch the fabric in through the inside of the oval. This is why you want the fabric to have some give. If you have to make relief cuts it may show on the inside of your book cover. Now take your smallest fabric strip and glue it over the spine of the flip book. Do not yet glue all the way to the ends. Turn your ends under and glue them between the fabric and the outside of the flip book. Cut about 2” from the collar at the buckle end. As I said before please feel free to use something from your child’s or your childhood: hair bows, tiny belts, etc. Most importantly it should be no less than 11” long. Sandwich the collar between the back plastic and the unfinished side of the cardboard with hot glue. Finish hot gluing the backs together. Buckle the collar to establish the length you will need to run across the front of the book. Tuck the remainder between the unfinished side of the front cardboard piece and the front plastic piece where it meets the spine of the book. Glue. Continue gluing the entire front cover to the plastic. 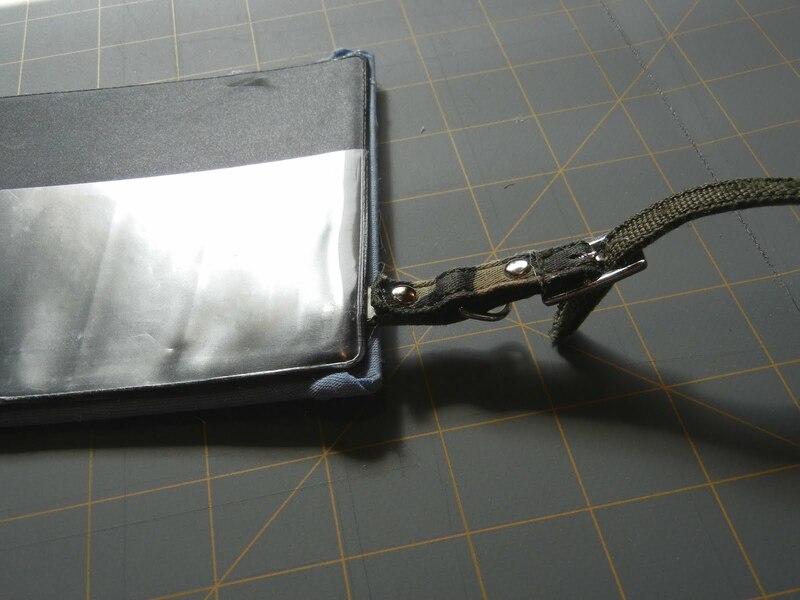 If you so desire, you can use metal corner crimps. I did, but I will say they were a hassle. Voila! 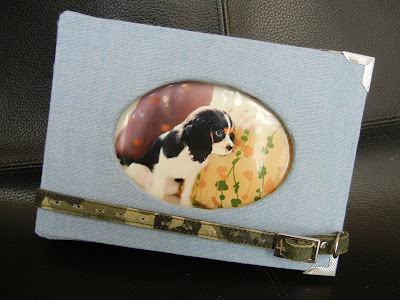 Unbuckle you masterpiece and place your pictures inside.